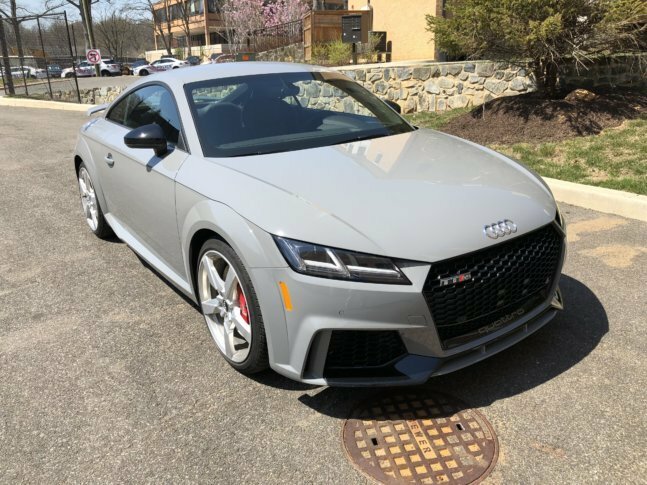 WTOP Car Guy Mike Parris says if you want a small, fast sports car that can give you super-car thrills for less than super-car prices, the Audi TT RS is worth a closer look. WASHINGTON — When the redesigned Audi TT hit the scene a few years ago, it lost the cartoonish proportions from before and seemed like a more streamlined small sports coupe that could be taken seriously. There are three versions of the Audi TT; a mild-base TT with 220 horsepower, a 292 horsepower TTS, which ups the sporty factor; and now enters another option: the TT RS Couple, promising big-time performance. Audi turns to big power to motivate the small TT RS Coupe with a different engine, a five-cylinder turbo engine that pumps out 400 horsepower. The TT RS is on the next level for acceleration. You can hit 60 mph in less than four seconds. Quick acceleration is one thing, but the handling is also impressive. With the Quattro AWD and magnetic suspension, this coupe goes from sports-car firm to a track-focused ride that’s best for smooth roads only. Brakes are strong and ready to haul down this quick ride with authority over and over with no fading. The only transmission is a 7-speed S tronic transmission that offers lightning-quick shifts when you’re really accelerating. It can be a bit sluggish at the slowest of speeds in traffic, but it acts like a normal automatic in regular situations. I was surprised by how easy the TT RS was to use in the daily commute. It is slightly more firm over bumps than other Audi TT versions but never rough. Fuel economy was 21.3 mpg of premium which is a bit under the 22 mpg sticker but I can’t say I cared much. The looks of the Audi TT RS are more sculpted and racy than previous Audi TT models. This Audi hugs the ground, so be mindful of curbs and steeper driveways. The TT RS starts around $65,000 before options and it looks different from other Audi TT versions, with a more aggressive front end fascia and lower body extensions. Large 19-inch wheels are standard or choose the 20-inch which tacks on $1,750 that also adds blacked-out mirrors and exterior trim. Another $400 adds red brake calipers that work well with the cool Nardo Gray paint on this car. Out back there is a small rear wing and the black exhaust tips add flare and $1,000 for the RS Sport Exhaust. The interior isn’t some stripped-out shell in the name of speed. The Audi has speed and luxury trimming inside. High quality Nappa leather seats hug your body and keep you in place in turns. The diamond stitching contributes a luxurious look to the seats. My car had the optional RS Design package that adds more leather to the center console and arm rests plus some red accents on the seat belts and air vents. The Audi says it’s a four-seater, but very small children are about all that will fit. I could somewhat fit, but my head wouldn’t make it if you had to close the rear hatch. My car came with the $3,500 Technology Package that has the MMI navigation where you can use voice or touch controls. It works very well after a bit of practice. The center screen is gone in the Audi TT and is now part of the virtual cockpit, so gauges, phone and navigation screen are all in front of the driver only. It takes a bit of time to get used to, but the open and clean dash is much more appealing than a screen up on the dash. If you want a small, fast sports car that can give you super-car thrills for less than super-car prices, the Audi TT RS is worth a closer look. Plenty of power and Quattro AWD to help with handling make the TT RS a fun- to-drive year round, fun machine. Editor’s Note: Mike Parris is a member of the Washington Automotive Press Association. The vehicles are provided by STI, FMI or Event Solutions for the purpose of this review.